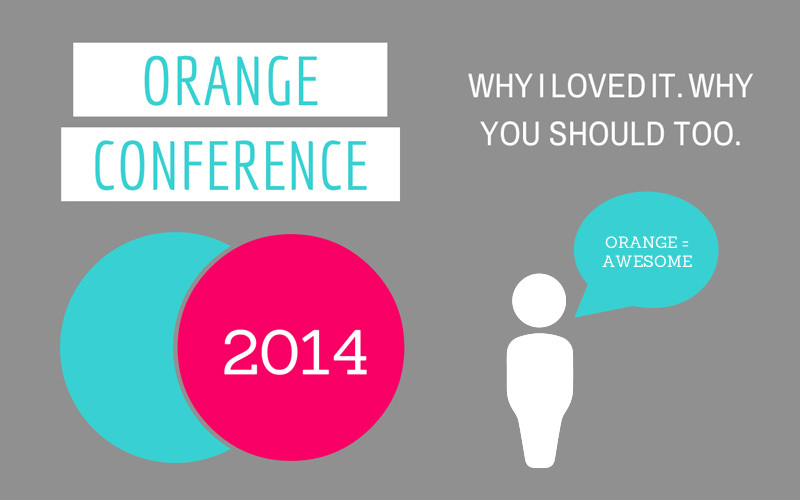 Getting to attend my first Orange Conference. And I have to admit. I HAD NO IDEA HOW INCREDIBLE IT WOULD BE OR HOW LOVED AND SUPPORTED I WOULD FEEL. Before I tell you about my favorite moments. You have to know what I think Orange Conference isn’t. It’s not a place for church leaders who like to camp out in irrelevancy. It isn’t stacked with perfect speakers, teachers, and leaders. It isn’t a place for dreams to die. It’s not about just the answers. It’s not a conference that’s going to tell you that you can do it on your own. It isn’t charlie brown teacher boring. It isn’t a place that leaves you feeling all over the place and no place at the same time. I’m pretty sure that no one goes to an irrelevant sort of conference in the first place. But there are some things that we keep participating in just because we have always done them in the past. And some of the things we do there keep us stuck and hang us up in irrelevancy. OC isn’t one of those places. I like that the leaders were honest, transparent, open…perfectly imperfect. Because, if I’m being honest, I know that people like that help me to be more honest, transparent, open, and ok with my own imperfections and uniqueness. I wasn’t kidding when I said from the stage that I felt like OC was better than Disney world. I haven’t smiled and laughed that much since the middle school dance episode of New Girl. My face actually hurt. Sometimes I don’t need another reason to dig down into my soul. Most of the time I need a reason to smile and let go of some of the heaviness we carry in with us. Opening night freed us up to fly. I’d rather have questions. I’d rather have a whole lot of conversation among friends about how we best love kids and teenagers in the tension instead of trying to explain the tension away. I loved how Reggie set that up for us. The tension brings the most opportunity for beauty, for growth, and for change. I don’t really want to hear that “you can do this” message outside of the context of the body of Christ. I didn’t hear much of this at Orange. It seemed like every speaker met up before conference to say that we are much better at saying yes together than we are at saying yes on our own. They articulated this well. There wasn’t a wasted minute and for that I was officially engaged and excited about leaning into what was being offered to us by so many. And my favorite part, was the theme. “YES” The entire week was carefully crafted to help us along, to help us align, and to help us with various degrees of attention deficit. I know it was hours and hours and hours of work–Orange friends behind the scenes thinking about the ministry leader in the seats. The investment was felt. Here’s a quick list of my favorite things. Each one of these deserves a blog post of it’s own. But for now, the mention. 1) A diverse group of women and men leading and communicating from the stage. 3) The art gallery (I could have spent more time there. I think all of us should have our own mini galleries of reminders and inspirations. I’d love to see what some of your offices look like. Mine is turning into a walk along the Champs Elysees. 4) Two of my favorite small group tools that have ever come along in youth ministry, the FREE Lead Small APP for small group leaders. SO AMAZING THAT WORDS CAN’T EVEN DESCRIBE. SIQ AMAZING & The Lead Small Culture Book by people who I adore. 5) A marriage book that’s going to help churches build marriages that last! 7) A-town A-list If I could have another wedding. I would. And I’d invite these people. 8) Montell Jordan Worship leaders who are story tellers are where it’s at. 10) The talks- Reggie, Mark, Andy, Perry, Heather…hands down, heartfelt, motivating, liberating. and we’re going to be better leaders and pastors because we spent a few days together. Thank you Orange for feeling like family. I can’t wait for OC 2k15. P.S. If you came to my breakouts and would like the notes contact me and I’ll send them to you! Could you please share your notes from your conferences in OC14. Thank you! We are from Guatemala and was an honor to hear you and learn from you.